Happy Birthday today to Graham Greene, Gordon Sumner, and Gandhi. However, it is also the birthday of NJ born legend: Bud Abbott. He's the straight man. Groucho Marx called him "the greatest straight man ever." 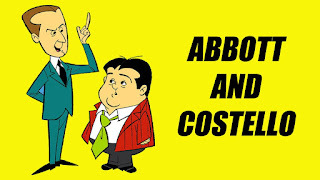 Abbott and Costello broke up in 1957. Who did the voice of Abbot and Costello in the 1967 cartoon series The Abbott and Costello Cartoon Show? You Won't Feel A Thing! Trivia Tonight @ Barmacy. Happy Lovelace Day! Trivia tonight 8pm!